The main objective of this seminar series is to enhance civic engagement with local governments units so the Heritage Conservation Society (HCS) can inform and guide them on the proper care and utilization of a valuable asset — built heritage resources. The first seminar was held last 8 November 2006, at the Development Academy of the Philippines, Pasig City. In our towns and cities, wanton real estate speculation and over-construction are often mistaken for modernization when in fact these exert devastating pressure on the historic and cultural core of many of our human settlements. As a result, a valuable economic resource – built heritage — is left to deteriorate or is thoughtlessly demolished in the name of progress. Concerted effort is imperative to protect heritage resources because these are revenue and job-generating assets that can spark economic revitalization, as the case of Vigan clearly shows. However, there is a general lack of awareness at the local government level, which is precisely where policies should be formulated and ordinances passed to declare heritage districts and protect these as the town's or city's prime assets. Built heritage resources should be the core of any master plan for urban development and inner town/city revitalization. Livelihood opportunities are generated by adaptive re-use, the revival of traditional crafts for restoration work and an increase in tourism receipts. Significantly, communities begin to feel a "pride of place". 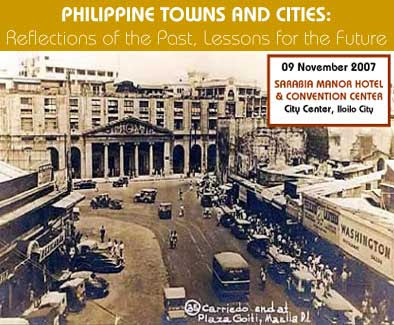 The "Philippine Towns and Cities" seminar series is a communications campaign to influence policy makers at the local government level. Through the "Mayors' Forum", best practices are shared. Other stakeholders in the Executive branch, the private sector and the academe are invited to participate because heritage conservation is a multi-disciplinary concern. In a second seminar, the Heritage Conservation Society will take this awareness and education campaign to the local governments of the Vizayas, where built heritage resources abound in the cities of Cebu, Bacolod, Iloilo, Dumaguete, Tagbilaran, and many others. Reflections of the Past, Lessons for the Future"